In a heavy 10-inch skillet, heat the butter over medium heat until it begins to sizzle and look hot. Break an egg into a custard cup, small bowl or saucer. Slip the egg carefully into the skillet. Repeat with the remaining eggs. Reduce heat to low. You should still be able to see and hear the eggs sizzle as they cook. If they stop sizzling, turn up the heat a little. Cook uncovered 5 to 7 minutes, frequently spooning butter from the skillet over the eggs, until the whites are set, a film forms over the yolks and the yolks are thickened. Omit butter and use a nonstick pan. Cook eggs over low heat about 1 minute or until edges turn white. Add 2 teaspoons water for each egg. Cover and cook about 5 minutes longer or until a film forms over the top and whites and yolks are firm, not runny. 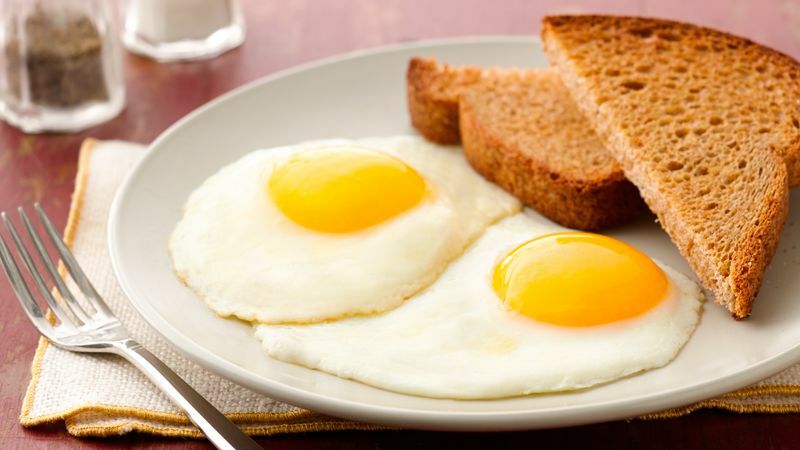 Follow directions for Fried Eggs, Sunny Side Up, but after cooking 3 minutes, gently turn eggs over with a wide spatula and cook 1 to 2 minutes longer or until yolks are thickened. Store eggs in their carton in the refrigerator. Keeping them in the carton protects them from absorbing refrigerator odors. Store the carton on a refrigerator shelf, where it is colder, rather than in the door. Break each egg into a custard cup, small bowl or saucer. Slip the egg carefully into the skillet.